Thugs of hindostan is a historical action drama film starring Amitabh Bachchan and Aamir khan in the lead roles. Thugs of Hindostan is directed by Vijay Krishna Acharya of Tashan and Dhoom 3 fame. Having directed two atrocious films before, how does Vijay Krishna Acharya fare in this film? Is the film watchable? Let's find out in this review. Read on. The year is 1795; King Mirza Sikander Baig's (played by Ronit Roy) kingdom is under the British threat. Sensing the imminent danger, King Mirza Baig sends his loyal guard 'Khudabaksh' (Amitabh Bachchan) to Durgapur along with his son, to ask for help. But the British capture the prince, and Khudabaksh somehow escapes. British officer John Clive uses the prince as a pawn and overthrows the king, and later kills him and his family. But Khudabaksh shows up and rescues the princess from getting killed. They go into a hiding, and several years later, they assemble a small army of sailors and plan to remove the British from their kingdom which they had lost. The British take help from an untrustworthy treacherous 'Thug' named "Firangi Malla" (Aamir Khan) to capture Khudabaksh. Will the British succeed in their plan? Or will Khudabaksh's small army be able beat the British and regain the control over their kingdom? Watch the movie to find out. Thugs of Hindustan gets down to business right from the start and it gets a linear narration without any flashbacks, that flows smoothly for most of the film. The characters are well developed, especially Firangi Malla. The movie moves forward at a pretty consistent pace, neither too slow nor too fast. It does manage to hold your interest for most of the film, but the film becomes quite predictable at times. There are a couple of twists and turns in the tale that will take you by surprise, but for others, you can see them coming from a long way. 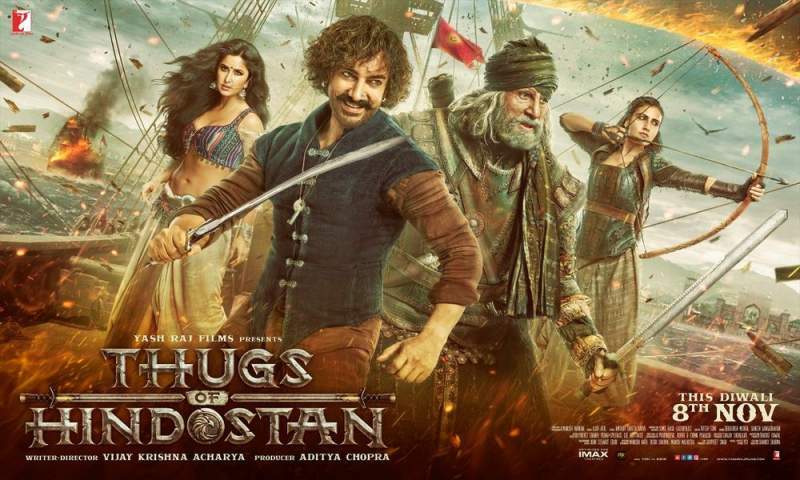 The songs in Thugs of Hindostan are mediocre at best and only add to the runtime making the film lengthy, especially the last song near the climax of the film. 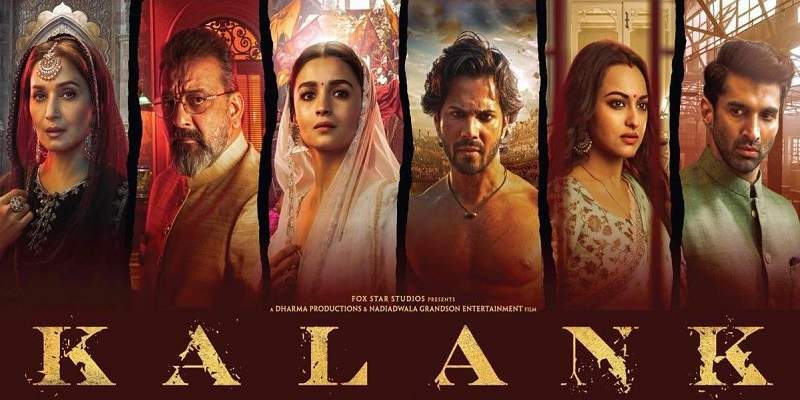 Katrina is a very good dancer and she does a really good job with her dancing, but it doesn't add much to the film and just stagnates the pace of the film. The character Surraiyya, that Katrina plays, feels like a forced addition to the film and is there just to serve as an eye candy, and for commercial reasons. TOH's story doesn't warrant Surraiya at all. Dialogues in the film are above-average and it's Firangi Malla who gets the best lines, and Aamir khan does an amazing job playing 'Firangi'. Firangi Malla is also the best character in the film. 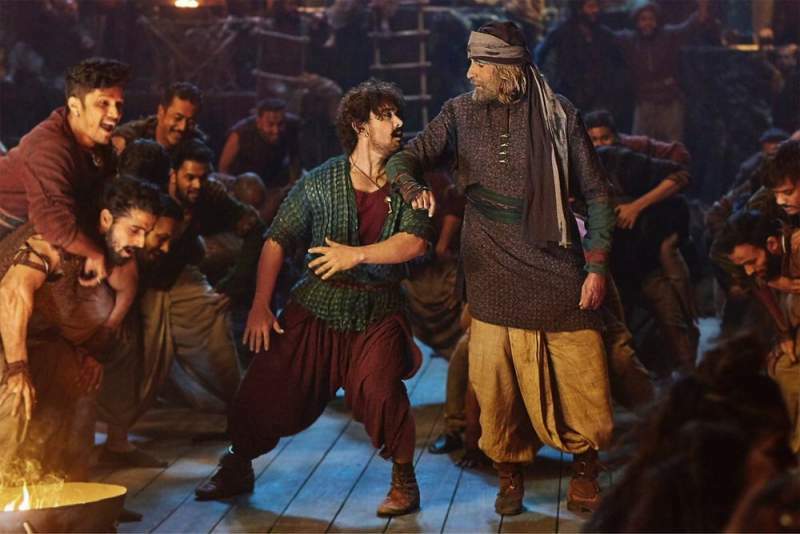 Amitabh Bachchan does a good job playing Khudabaksh aka Azad and makes it a believable character. Fatima Sana is average with her role as Zafira Baig. There are portions in the film that feel unconvincing and are undercooked. For example, the change of heart of Firangi Malla when he is fighting Khudabaksh. The cinematic liberties and too much melodrama, at times turn the supposedly serious scenes into laughable ones. Running at 165 minutes, TOH is a lengthy film, blame the unwanted characters and songs & dance. Otherwise, Thugs of Hindostan would have been crisp and more enjoyable. But still, Thugs of Hindostan is a beautiful film. Thanks to the brilliant camera work and the locations. Care has been taken with respect to costumes and sets, and it shows in the film. The action sequences are well executed and are delightful to watch. Seeing Vijay Krishna Acharya's name in the director's column, I was very sceptical watching this film, given the overwhelming negative reviews from the critics and VKA's previous excrescences called Tashan and Dhoom 3. But the film turned out to be pretty good. Definitely Vijay Krishna Acharya's best film. I do feel that critics have been quite harsh on this film. Did ask a couple of fellow audience, and they enjoyed the film as well. If you don't get bored easily, then you may like this film. You can see that TOH is inspired from POC. But Thugs of Hindostan is no Pirates of Carribean, it has got its own DNA (although inspired one). Watch the film for what it is. It has got excellent cinematography; amazing locations, sets, props, costumes; good characters, acting and a more than decent storyline and CGI. Thugs of Hindostan is definitely not a bad film. Just sit back, relax and enjoy the film. Aamir khan and Amitabh Bachchan fans shouldn't miss this film. Bottom line: Thugs of Hindostan is a beautiful and an enjoyable film albeit lengthy, and is definitely not a bad film.